“Behind every great man, is a great woman.” Or at least that is how the old saying goes. But how often do we get the opportunity to really know these great women? We see them standing next to their successful partners, but do we ever know what they contribute behind the scenes? This summer Library and Archives Canada created an opportunity to get into the mind of one great woman in particular—Lady Susan Agnes Macdonald (née Susan Agnes Bernard). 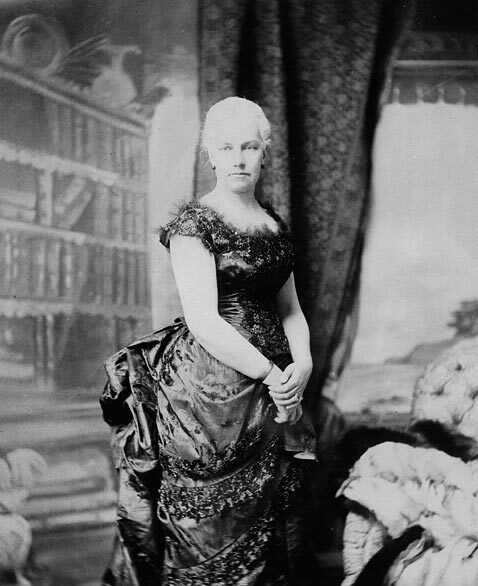 Susan Bernard married Sir John Alexander Macdonald, first Prime Minister of Canada (or the Dominion of Canada, as it was known at the time), in 1867. Five days after Sir Macdonald’s inauguration, his wife began documenting their new life. 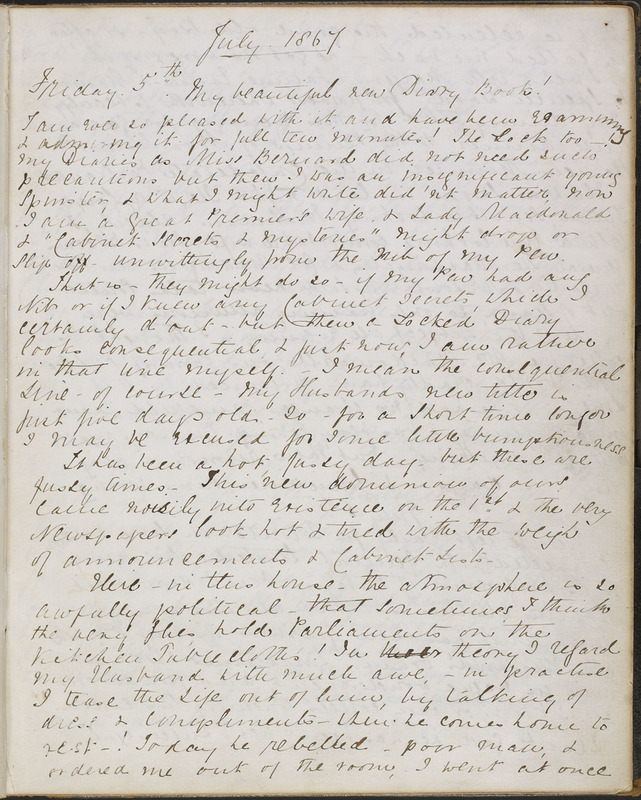 The very diary Susan Macdonald used was digitized this summer, in commemoration of Canada’s 150th anniversary, and made available online for the public to transcribe. In addition to providing a behind-the-scenes look at what it was like to take on an elite title, Lady Macdonald shares some of her insights into how the Dominion of Canada was formed. She gives a first-hand account of key historical moments that many of us have since learned about in school. One of the first things we notice as Lady Macdonald begins to share her thoughts and experiences is the love she had for her husband. Multiple entries gush about Sir John’s patience, love and ability to always put his best foot forward. Susan Macdonald was a strong supporter of her husband, in terms of both his career and character. 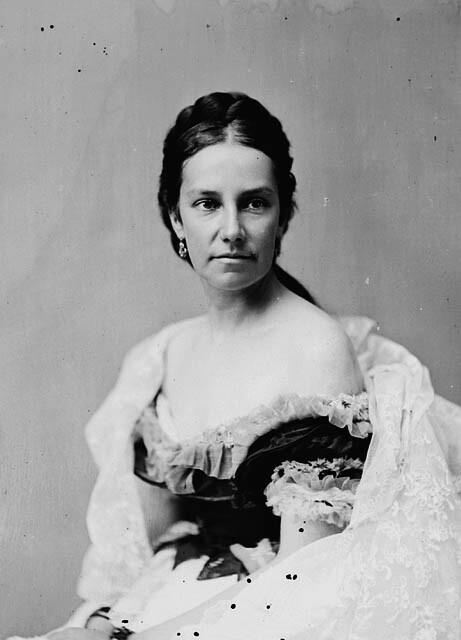 Her love led her to join him on many confederate-related work missions, socials, voyages and more. Due to her strong interest in her husband’s political life, Susan Macdonald was able to witness multiple events that are taught as pivotal points in many history classes today. One example is a series of entries that follows the assassination of Thomas D’Arcy McGee, Father of Confederation, and the subsequent trial. Lady Susan’s writing gives insight into the details of McGee’s death (for instance, that he was killed while unlocking his front door after coming home one night), the thinking among the populace at the time, and the process of collecting evidence against suspected killer Patrick Whelan. Susan Agnes Macdonald’s diary gives readers the opportunity to time-travel back to the late 1860s and bear witness (although from one person’s perspective) to a segment of early Canadian society. It was not just by sharing public opinion regarding specific events that Lady Macdonald painted an image of her life for future generations to discover; it was also in the way she described Ottawa at each time of the year, enabling us to compare it to the city we know today. She shares details of meals eaten and customs followed, some of which may be very different from current practices. The theme of religious faith recurs often throughout Susan Macdonald’s pages. Whether she was writing about going to a church service or documenting prayers she hoped would be answered, every few entries highlight moments in her and her husband’s spiritual lives. It is possible to relate to some of Lady Macdonald’s diary entries describing the stresses of her new responsibilities as the Prime Minister’s wife. Just as you or I might experience the pressures of a new chapter in our lives, she describes being nervous or fearful that she does not know what she is doing. At one point, she describes herself as “a novice” in her new life. 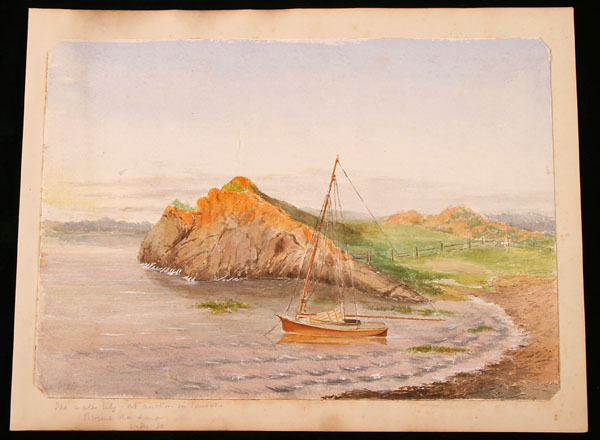 The transcription of Lady Susan Agnes Macdonald’s diaries is now complete, but the digitized diary is still available online. It gives insight into not only the type of woman Mrs. Macdonald was, but also the type of world Canada was as it first began. Ayla Maud is a student archival assistant with Regional Services and the ATIP Division of the Public Services Branch at Library and Archives Canada. This entry was posted in Our Collection and Facilities, Politics and Government and tagged 1867, baroness, Diaries, Dominion of Canada, John A. Macdonald, Lady Macdonald, Susan Agnes Macdonald by Library and Archives Canada Blog. Bookmark the permalink.